The advent of minimum tillage and no-till farming systems has resulted in farmers seeking new ways to handle the burden of stubble residue, accumulated over years. This has seen some operations go back to burning stubbles. This is leaving the country bare, with excessive baking of soil, water erosion and run off. However there are some positives. Burning stubbles minimises trash interference in seed drills, maximises the effectiveness of pre-emergence spraying and gives some control of snails and carry-over diseases. What has been seen is a lot of farmers embracing the concept of strategic tillage. One of the benefits of strategic tillage is stubble incorporation, which allows microbes and the soil biology to effectively breakdown stubble, building humus levels in the soil. Humus is an essential component of healthy soils. It has many great benefits; it improves soil structure, has high water-holding capacity, and supplies a rich source of nutrients. It also allows more oxygen to enter the soil increasing root growth, and increases water penetration into the soil. Through strategic tillage, rough and rutted country is made level, weeds become manageable and residue is broken down to allow for trash flow through seeders. 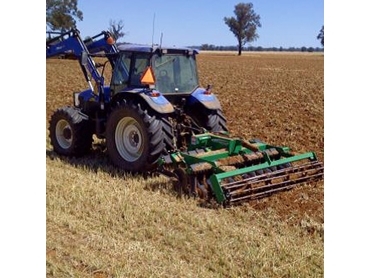 The Speedtiller® has found a niche in the strategic tillage system, as it can transform a rutted, weed infested paddock into a level seed bed, finished and ready to seed. This is due to the action of the singularised rubbertorsioned jump arm system with disc undercut and the effective action of the levelling crumbler roller. These machines are the only compact disc designed and manufactured in Australia. The Research and Development team at K-Line have designed the Speedtiller® to withstand Australia’s demanding working conditions & given it the leading edge in the field.